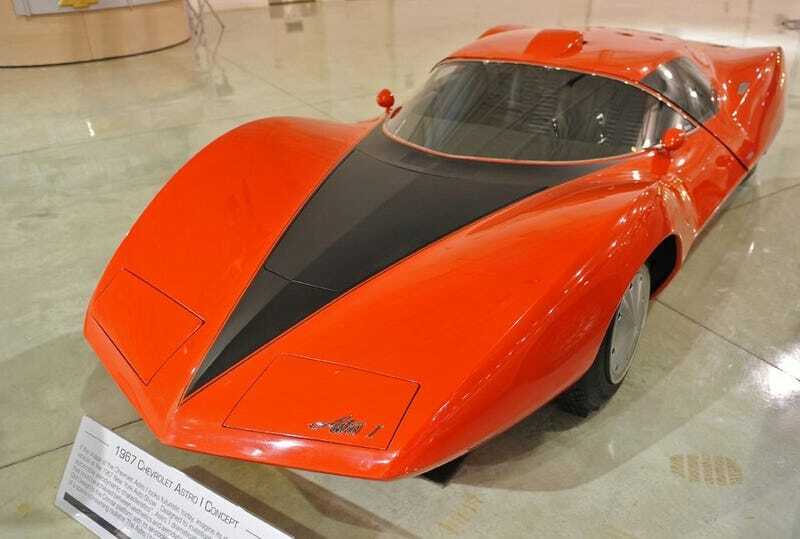 The 1967 Chevrolet Astro 1 Corvair Corsa was designed by Larry Shinoda (who you may know from the split-window c2) in order to explore the "visual potential of automobile aerodynamic characteristics" (read: reduce drag). It was launced at the New York autoshow in 1967. The body is composed of fibreglass. Though it retained a rear-engine layout, the fiberglass-bodied two-seater actually used semi-monocoque construction, with custom box-section side sections, integral belly pan and bulkheads to provide outstanding rigidity combined with low mass. Even the windshield header was forged aluminum-very exotic for the time. Twin handgrips replaced the steering wheel. More jet fighter cues were present as well, from the head to toe bucket seats, and a control pod to the left of the driver. There is an intricate mirror system inside in order to provide the driver with unobstructed rearward vision. Suspension is double wishbone at the front and rear. Custom control arms were used at all four corners, as were disc brakes and custom magnesium eight-bolt wheels, which featured removable outer rims available in a variety of widths. The two-seater was fitted with 5.5-inch wide wheels in the front and 7-inch wide wheels in the rear. Centrifugal blowers were used to cool the engine rather than ducts, as those reduce drag. It is less than 3 feet high (35.5 inches). It has an 88-inch wheelbase, with an overall length of 176.75 inches, an overall width of 72.24 inches and track widths of 54.68 inches in the front and 55.9 inches in the rear. The entire body aft of the windshield was one piece and tilted up and back with a large screw mechanism. At the same time, the two bucket seats lifted out of their normal positions to aid ingress and egress. Once the driver and passenger were seated and strapped in, the clamshell would close and they would be lowered into their normal semi-reclined seating position. It features a flat 6 engine which displaced 176 cubic inches, while it was fitted with a special cooling system using three centrifugal blowers, in order to keep the height as low as possible. The engine was capable of producing 240 BHP at an amazing 7200 RPM, which was possible as the cylinder heads were fitted with one belt driven OHC. The combustion chambers were almost hemispherical and two triple Webers 40IDA were fitted. If you made it this far, please comment. It makes me feel loved.